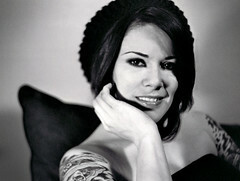 In my opinion, portraits can be the most interesting photos and they seem to naturally draw our attention. Why? I think we’re programmed to enjoy looking at photos of other people. Every person is different and we’re naturally curious about those we see in photos. In fact, I’ve often thought that the most important element of a photo is the human element. As a photographer, you may already know that portraits are also one of the most difficult photos to pull off. Working with people and capturing them in a way that conveys their true beauty is not as simple as pushing a button. Portraits can be created in so many different ways that it is impossible to learn it all from a short article. The Essential Guide to Portrait Photography is a collection of stand-alone lessons on various aspects of portrait photography. This eBook (PDF format electronic book) covers everything from technical to inspirational, and the information contained is top notch and well written. 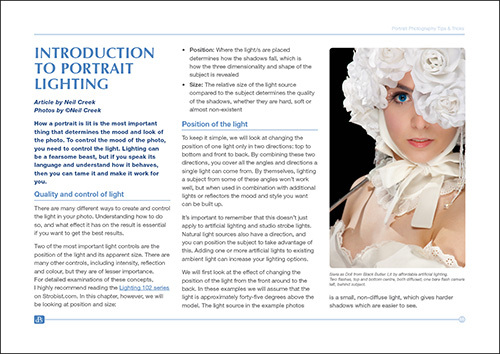 You can purchase The Essential Guide to Portrait Photography from digital Photography School. Links in this post are affiliate links to the product — It doesn’t cost you anything extra, but I get a cut of the sale. 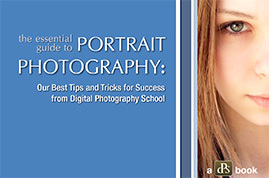 The Essential Guide to Portrait Photography is a 78 page downloadable eBook containing 25 lessons in portrait photography. The 3 column layout is incredibly clean, easy to read, and flows naturally. Photos are scattered throughout as supporting material or examples to the lesson. Each lesson is written as a stand-alone topic typically 3 or 4 pages long. The sections provide the essential learnings for the topic at hand. The idea is that you can read through one or two sections, soak it in, try out what you’ve learned, and go back to another section when you have time. There’s no need to read the entire book cover to cover before applying what you’ve learned — in fact, I wouldn’t even suggest doing so. There’s so much in this book that most of us wouldn’t be able to take it all in at once. To give you an idea of what the book contains, some of the sections include: photographing children – composition, how to photograph people when travelling, environmental portraits, a fresh look at depth of field, portrait photography’s power posing, the human side of photography, 11 tips for better candid photography, shooting like a pro on a budget, and lots of other good stuff. So you can see that the topics are widely varied — some instructional, some inspirational, and some in between. And as a bonus, the end of the book contains interviews with 6 very different professional photographers. They lay down all sorts of great insight and inspiration too. 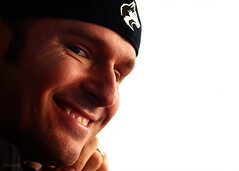 The photographers include David Duchemin, Neil Creek, Jack Hollingsworth, Kris Krug, Chase Jarvis, and Bert Stephani. 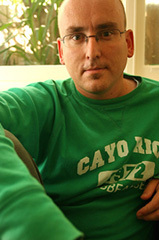 Darren Rowse is the primary author and editor of the eBook. He’s also the mastermind at the wheel of digital Photography School. 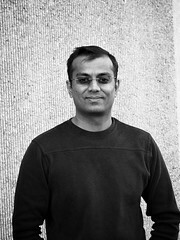 Over 15 of the 25 sections of the eBook were written by Darren. 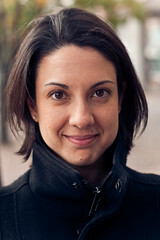 The remaining articles were authored by various contributors including Natalie Norton, Christina N Dickson, Nathan Marx, Alexis Godschalk, James Pickett, and Neil Creek. Truly a great resource. I don’t know how else to say it! This is definitely more than a random collection of articles or a typical book. It’s really a resource that you can learn from, explore, and go back to as needed. You may not need every single lesson today, but most of the sections contain usable information and instruction for a large percentage of photographers out there. Whether you’re shooting informal family pictures or professional portraits, you’ll likely find new things in this eBook. The content seems to be geared mainly toward intermediate/advanced amateurs looking to step it up a notch, but the voice of the writing is accommodating to beginners too. And even professionals need to keep learning new things in order to keep up with the times — I’m sure they can find a few nuggets of wisdom in there. Highly recommended for any photographer interested in learning more about portrait photography. You can purchase The Essential Guide to Portrait Photography for $14.95 until December 1, at which point it will return to the regular price of $19.95. 1) Submit a photo and/or link to a portrait you’ve taken. The photo must be your own. Bonus points for supplemental descriptions. 2) Submit a Flickr Gallery of portraits. Curate a gallery and pop the link in the comments below. Bonus points for supplemental thoughts within the gallery and/or comment. OK, so get your entries in soon! One entry per person. I’ll choose and announce the winners on (or near) December 2, 2009 — one winner for a personal photo, and one for a gallery. If, for some reason, we happen to have no entries from one of the categories, I’ll choose two winners from the category that has entries. [UPDATE 12/3/2009] Contest winners have been posted. This entry was posted in Features, Reviews and tagged book, ebook, photography, portrait, portrait photography, resource, review on November 27, 2009 by Brian Auer. here’s a portrait of a wedding i shot. i noticed a beautiful soft light hitting the subject from a window camera right from a subject. With the white curtains behind the subject, i wanted to create a high-key portrait feel. In order to get this effect, i exposed for the curtains at the back in order to wash out it out. A few tries and I was able to get this shot. Taken the day before Thanksgiving. 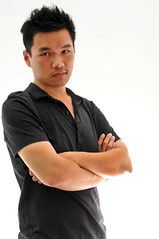 One speedlight shot through an umbrella, one with a Fong diffuser. Self portrait with ambient light, tried to do something conceptual. Edit – black and white + infrared filter. a self portrait using available light and a flash with a small (diy) softbox camera left. Completely natural light outside of my front door. This little girl became infatuated with me and was very difficult to photograph because every time I would get down on her level, she would want to come over and lean on me and giggle. It was very cute, albeit a little frustrating. 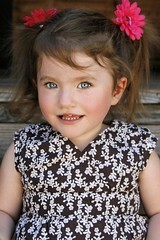 We did walk away with some beautiful pictures, though, including this one – her mom’s favorite. This is shot pretty wide open, and I dodged and burned a bit in Photoshop CS3. Shot on railroad tracks. Subject is sitting on a utility box. It’s 50 degrees and drizzling near dusk. Shot at f.4 1/50 ISO 320 using canon 50mm 1.4 prime lens. Processing = surface blur, add noise, gradient map for b&w conversion. Switched to grayscale and used the duotone selection to create a quadtone image. I love portraits, and I think the most interesting thing is oftent he eyes. This little one was really smart and thought everything through before taking action, and this is him evaluating the photo-taking prospect. This is the first shot I took of him, but remains one of my favorites because of what you can see in those big round eyes. I love the detail, and composition, but mostly the “moment” captured in this portrait, which is why I chose it! This little girl instantly got my interest in photographing her. I was captivated by her innocence and perhaps a little saddened by a certain abandoned gaze in her eyes. The place is ‘Jaglot Gor’ on the way to Hunza from Gilgit, Northern Pakistan. We had delicious Chapshru (a local dish) here. Nikon D700 – Nikon 70-300mm VR. This photo was taken a couple of weeks ago in front of an industrial shed. Shot with natural light. My daughter shot in an impromptu studio in our living room with a direct strobe at her left and a 2nd light bouncing off a white board to her right. My first attempt at studio lighting. Taken last weekend, very hard to get them both in the same frame! 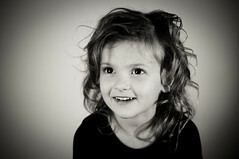 This is a photo I did of my niece. We had perfect light out on the beach and it was fun shooting such a lovely person. 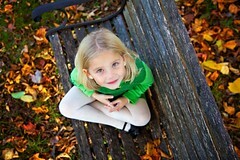 This was a recent Fall portrait session…this sweet girl was so much fun to shoot. This was shot with natural light…f 4.0…Canon 5D Mark II, 45mm focal length. I love the color and her eyes make me melt!! This is my niece, the “Queen of the Faeries”. Shot with my Sony DSC-W200. Iso 100, f11@1/250. Shot from a low angle with the sun directly behind her head, foil reflector. Photographing special needs children is often fraught with unexpected challenges — shyness, unusual secretions, tears, long periods of waiting. 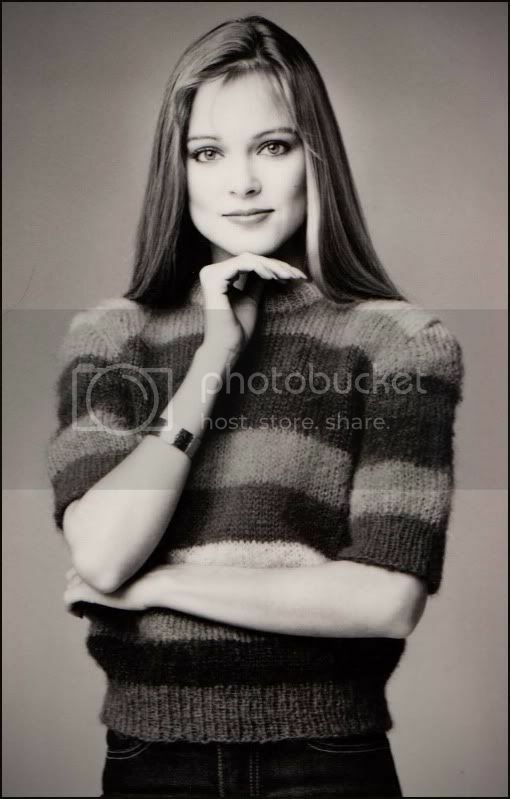 However, I’ve had wonderful experiences and the results often become some of my favorite images. Staying in touch with the family also brings great rewards. The girl pictured above couldn’t walk on her own when this photograph was made. Three months later, after a lot of physical therapy, she was not only walking on her own but she was making great progress with speech therapy and was eager to show off her new skills. Most importantly, when it comes to families of special needs/ill children, you’re often giving the parents memories so you really need to work at creating the best experience you can for everyone. I am normally too terrified to ask anybody to let me take their photo, but I got up the nerve a while back when the PhotoChallenge.org theme of the day was “Black and white Portrait”. This is a co-worker who agreed to give me a few minutes; we just stepped outside our office building into open shade. Given my complete cluelessness on portraiture, it was at least not a total failure. Took this the day after Thanksgiving on Lake Ontario. Storm was coming in. 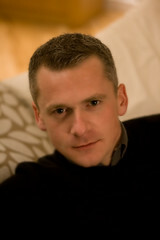 This is a portrait I took of a close friend called Hobson. He agreed to have his picture taken without protest. It was taken with available light with a off the ceiling bounce flash. He is a very quiet companion. For me a perfect portrait is when I capture the true “essence” of the person being photographed – it may be their pose, something unique about their features, or even the way that they present themselves as a person. The photo was taken with Canon EOS 10D, f/5.6, 1/350 sec, ISO 400 and zoom lens at 105mm in natural light. I was shooting in burst mode. Here’s a link to my Children set on Flickr: Children Set. using remote fired speedlite and low ISO (100) to diffuse midday light but allowed the ladder, fruit and leaves to burn out to leave the feeling of bright sunshine. Some light adjustment to balance shadows done with Nik Viveza. Taken available light only around 1:30pm, with a Canon 50/1.8. Some light post-processing to clean-up some stray hairs and give it a cooler tone for the fall. My son Philip started to try every hat he could get his hands on during this visit to Portobello street market in London. I had to struggle between keeping an eye on him while he run around and getting his face within focus with the lens quite open to make up for the lack of light under a bridge on a cloudy morning. Claudia, best friend. Taken with a Pentax K-1000 on Kodak BW400CN film. I had an opportunity to sit behind the scenes of my buddies photo shoot and he let me sync with this lighting. I got this one of my wife during a short break. I went out on a shoot one day and found a park in downtown Memphis. There was a band playing and the lead guitarists was amazingly good for the camera! How do you get a self portrait of you and your two year old? Why you have your 4 year old “press the silver button” while the camera is on a tripod… You get a great picture and your 4 year old becomes insanely proud of his photography skills. Everyone wins. Cheers for a great contest! My daughter Fernanda. If I remember well (I took this one a while ago) I used a Nikon SB800 to illuminate the background wall. On-camera flash too. Taken in Destin on the beach, it was a windy and overcast day. Taken in jpg, before I learned the power of RAW. I’ve picked out the two winners… contest is over. But feel free to keep adding your portraits if you’d like. Just curious on who won? I’ll be posting them soon… just waiting for one email response. Pingback: Photography Books Make Great Gifts!